It is a trivia question asked in school – who invented the lightbulb? Thomas Alva Edison, who is often credited with inventing the lightbulb also did a lot of other great things during the course of his life and this is a short biography compiled by Hourly History. It starts with early life and Edison’s very early interest in business, wherein, he ran a local newspaper. Post that, it moves on to some of his early inventions, his setting up of his Menlo Park lab and also busting the myth of his invention of the lightbulb (he had merely improved it and made it commercially viable for the masses). It also talks about some of his less known inventions which revolutionised our lives today, such as the motion picture camera. It also talks about his business ventures (which is today known as General Electric) and his rise and fall in that field. 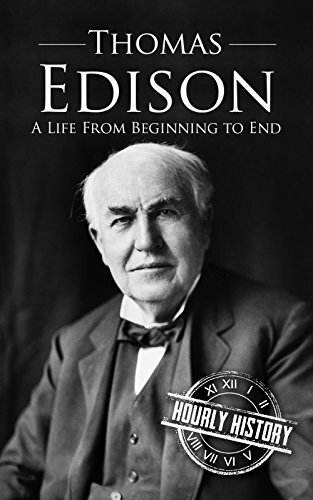 This book brought about a rare feature of Edison, being, one of the previous century scientists who had the drive to invent and also the business acumen and ensuring its commercial success. It also brought about his mission to impart knowledge to people, wherein it brought about his visible dislike over the fact that people used the motion picture camera for making films whereas he intended it for educational videos. Moreover, they weren’t bent on glorifying Edison, they did bring about his relentless pursuit of trying to discredit Tesla’s AC motor, a campaign which eventually took his own business out of his management. Yet again, my only point repeatedly with regards Hourly History books featuring scientists, inventors, engineers, etc. is that they can illustrate some of their works, such as the images of some of his inventions or the design of it made part of the book. This was especially true when they were describing the phonograph. On the whole, this is a fine read about Edison, I got to know a few things about him which I didn’t know in the past (such as his role in revolutionising the film industry). I would award the book a rating of six on ten.